It’s the semi-finals for Season 11 of Face Off. The four remaining All-Stars are competing for three slots in the finale. Each must create a gargoyle based on an architectural style. Who will make it through the gargoyle gauntlet? Results ahead. McKenzie Westmore greets the contestants on the roof of a downtown Los Angeles building to present the semi-final challenge. Each All-Star must randomly select an architectural style and create a gargoyle complete with wings incorporating motifs of the selected style. Emily selects Art Deco. Random chance worked in her favor since I think Art Deco is the easiest of the chosen styles to visualize and design. If she had drawn Deconstructionism I’m pretty sure she would have floundered. 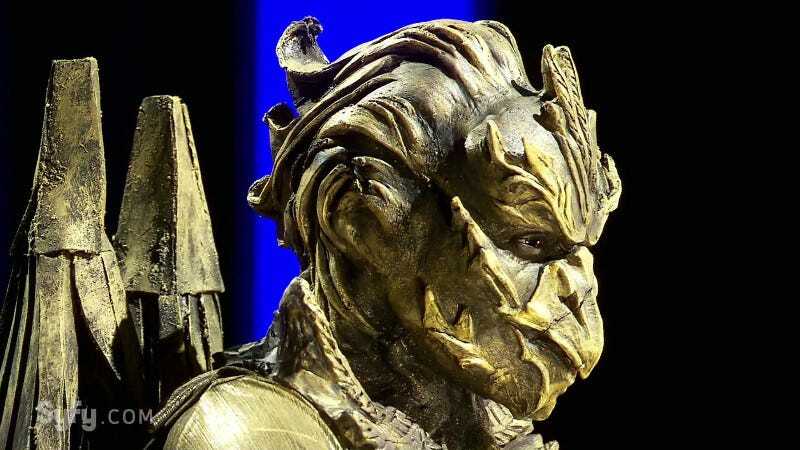 While I do think Emily’s gargoyle was good enough to get her to the finale I disagree with the judges that it was the best one on stage. But it’s their decision to make. Emily wins this week’s challenge and is the first All-Star to make it to the finale. Cig selects Russian Renaissance. As with last week, Cig puts in an enormous amount of work to create a visually striking design that stands out from the others. This is the look that I think should have won but it still gets Cig selected second for the finale. George selects Deconstructionism. He is stumped at first before he realizes that the movement is basically flipping a middle finger at traditional architectural styles. That’s something George can relate to and he gets to work. The wings and horns wouldn’t have worked for most designs but they work for a Deconstructionist style. The judges both love and hate it but that’s the effect the style should have. George is the third All-Star going to the finale. Unlike the others this is his first time making it to a season finale. Tyler selects Victorian. While his gargoyle is well done technically, the judges don’t think it really projects any particular Victorian aesthetic. The judges also note the similarities in the face shapes of his designs. At this point in the season, that’s all it takes to not make the grade. Tyler is eliminated this week. Going into this episode I would have guessed Emily would be the one going home and Tyler would breeze into the finale. So much for my prognostication ability. I still don’t think Emily will win the season; Cig is producing more consistent quality work. But we’ll see. I’ll also do a quick shout-out to Neville Page’s tie (and pocket square). My jobs haven’t required me to wear a suit or even a tie but I appreciate a good tie game when I see one.